As consumer demand for high-quality content continues to rise, Western Digital Corp. (NASDAQ: WDC) is enabling a bigger, faster experience with new industry-leading solutions that give consumers the best combination of performance and capacity so they can do more with the rich content they capture. At Mobile World Congress, the company is showcasing the world's fastest 1TB UHS-I microSD flash memory card, the 1TB* SanDisk Extreme® UHS-I microSDXC™ card. The new card features higher speed and capacity for capturing and moving massive amounts of high-quality photos and videos on smartphones, drones and action cameras. These impressive levels of capacity and speed give consumers the ability to create all the content they want without worrying about space limitations or long transfer times. Today's smartphones and cameras allow consumers to create high-quality content in the palm of their hands, thanks to features like multi-lenses, burst mode capabilities and the 4K resolution. Western Digital continues to deliver the most advanced solutions to ensure consumers can reliably capture and share a special moment or create video content for personal or professional use. "People trust SanDisk-brand cards to capture and preserve their world. Our goal is to deliver the best possible experience so consumers can share the content that's important to them," said Brian Pridgeon, director of marketing for SanDisk-branded products, Western Digital. Designed to help move tons of high-quality content faster than ever, the 1TB SanDisk Extreme UHS-I microSD card reaches speeds up to 160MB/s1. This new card allows consumers to transfer files in nearly half the time over standard UHS-I microSD cards2 currently on the market. The cards reach these record-breaking speeds by leveraging Western Digital's proprietary flash technology. The new SanDisk Extreme card will also be available in 512GB* capacity, and will feature the A2 specification3 for launching and loading apps at blazing speeds. 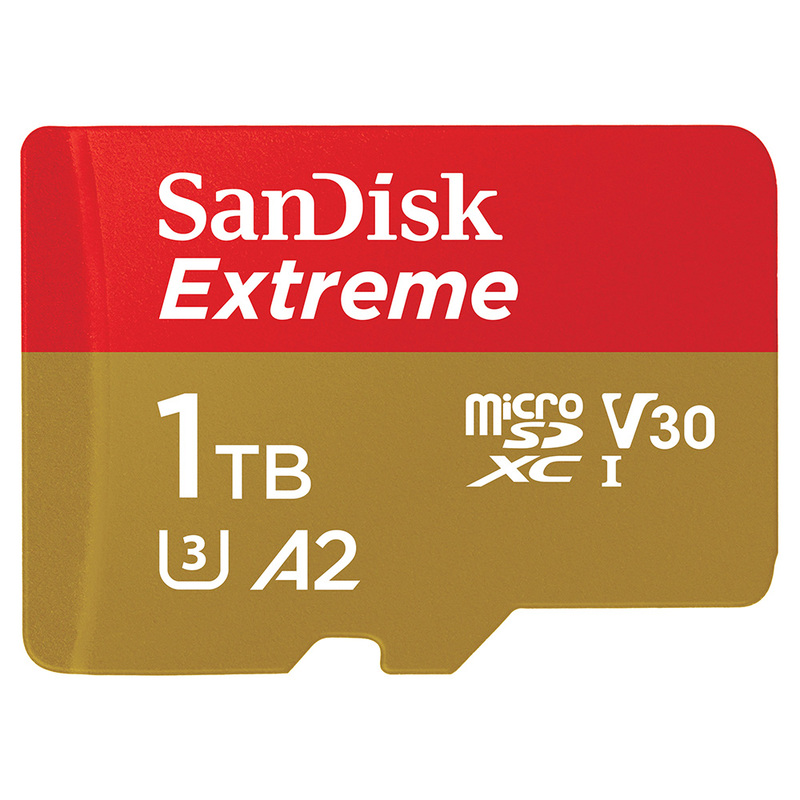 The 1TB and 512GB SanDisk Extreme UHS-I microSD cards are available for pre-order now on SanDisk.com, and will be available at select retailers in April 2019. The cards will be priced at U.S. MSRPs of $449.99 and $199.99, respectively. Western Digital offers the industry's broadest portfolio of products and solutions to help people capture, preserve, access and transform their personal content. For more information, visit our websites: SanDisk and Western Digital. Though the size is a benefit, I imagine few computers and devices can take advantage of the speed. Can't wait for the trickle-down to SSD's. That would be a nice upgrade for one of my raspberry Pi's. Overkill size wise for what I do on them though. Also kind of hard to justify speeding that much for a drive for a 35 dollar computer, lol. I'm sure people will have a use for one. Video cameras etc. SD card technology does not trickle down to SSDs. SSDs are fast. SD cards are slow. This new 1 TB card may be the fastest SD available ... it's about as fast as a conventional HDD ... but it's WAAAAAY slower than an SSD. SD card technology does not trickle down to SSDs.SSDs are fast. SD cards are slow. You're right margrave, I got the speed mixed up. Thought is was over 1gb/sec. It's only 160mb/sec/. My SSD does 600mb/sec. Some of the M.2 SSD's are getting 1.2gb/sec., but only on benchmarks. I have a WD Caviar Blue 500Gb sata drive mounted in a Digitus USB enclosure. This drive has been working fine until I installed Windows 10. Now I get a message that the drive failed to enumerate, (Code 35). C an anybody help please? After doing a clean install of windows 10 build 10130; my western digital my book 1tb external usb 3.0 hard drive will not retrieve my backups. Is this a possible windows 10 glitch; or is this a internal hardware issue with my device?